Day 26 | Jamestown-Fargo | captain-nicholls | Le Tour de U.S.
Woke up to another room flat. Changed it before we left for breakfast. We had the buffet at the motel and were on the road by 9. We did a big first pull of 80 km. Stopped at a cool diner/bakery in Tower City. I had my first piece of pie with my crispy chicken wrap w/salad and an incredibly large glass of chocolate milk :) [Bolze put half his wrap in his trunk bag (classic Bolze move, he says he'll eat it later) and threw it out when we got to our motel room]. After lunch we hit highway 94 again as the back roads are unpredictable with gravel sections. Carl and I were a bit ahead of Trevor and Francois when I noticed they had dropped off. I called to Carl, he continued on, and then I turned around. I assumed it was another flat. When I reached Francois and Trevor, Francois said that he had collided with the road construction sign and then hit the road. His forearms were quite swollen and looking bruised. He sat down while Trevor took his bike and I called Casselton to see if there was a doctor Francois could see. They said Fargo as the closest place for medical services.The force of the impact had pulled his pannier bags off his rack, breaking one of the clips. Francois rigged it up with some zip straps after Trevor bandaged up Francois' elbow, which was scraped up a bit as well. 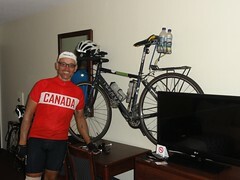 Francois was feeling a bit better and said he would try riding to Fargo, another 60 km. Carl had gone into Fargo when he got my text telling him what had happened. 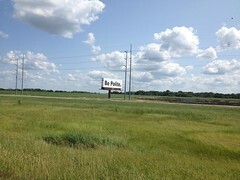 He secured a cheap motel and we had already decided to stay 2 nights in Fargo, in part because of Francois' accident but also because it is time for a break. 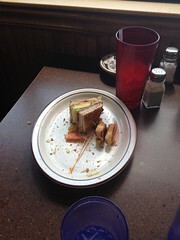 Carl's unfinished lunch. This doesn't happen. Today we left Jamestown for Fargo. Oh jeez Margie.